I start­ed a re-read of DC’s New 52 when I moved to LA as a way to orga­nize my book­shelves since they got jum­bled up in the pack­ing and unpack­ing process. In hon­or of DC’s Rebirth event and the restart of this blog, though, I thought this would be a good time to put some thoughts down. Orig­in is the offi­cial DC launch point for the New 52 sto­ry­line, so I will start here and mean­der on fol­low­ing in-uni­verse chronol­o­gy as best I can. Jim Lee is a god to me so Art is pret­ty much an auto­mat­ic 5 out of 5. Sto­ry, I liked a lot, too. 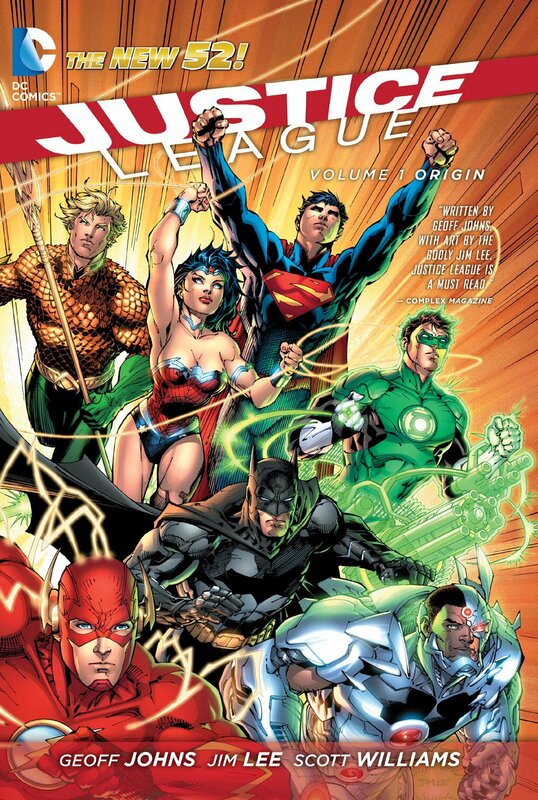 I was not sure what to expect from the New 52 reboot, but I appre­ci­at­ed how Geoff Johns pulled this off. The super­heros are estab­lished (so there is no need to rehash all their orig­in sto­ries), but not pub­lic, so the world still does not know much about them and they do not know each oth­er (giv­ing a great oppor­tu­ni­ty to tell each oth­er about their abil­i­ties). Darkseid’s prob­ing attack serves as the world’s first extinc­tion-lev­el threat and the cat­a­lyst for Bruce Wayne (Bat­man), Hal Jor­dan (Green Lantern), Clark Kent (Super­man), Bar­ry Allen (Flash), Diana Prince (Won­der Wom­an), Arthur Cur­ry (Aqua­man) get togeth­er, as well as the orig­in for Vic­tor Stone’s (Cyborg) pow­ers. It also intro­duces sev­er­al sup­port­ing char­ac­ters, such as Silas Stone, David Singh, Steve Trevor, Antho­ny Ivo, Sarah Charles, Thomas Oscar Mor­row, David Graves, Grail, DeSaad, Step­pen­wolf, Pan­do­ra, Phan­tom Stranger, Spec­tre, and Ques­tion. More are men­tioned, like Guardians, Goril­la Grodd, Lex Luthor, William Mag­nus, Ryan Choi, Oliv­er Queen (Green Arrow), Zatan­na Zatara, and Carter Hall (Hawk­man). And the stage is per­fect­ly set for the less-than-per­fect team dynam­ic. A few rela­tion­ships have already been formed. Bat­man has files on every­one, of course. Green Lantern and Flash fought Goril­la Grodd togeth­er. Super­man dis­likes Lex Luthor. Steve Trevor is Won­der Woman’s liaison. Over­all, it is action-packed and full of laughs. I tell every­one who lis­tens that DC had a blue­print right new here for launch­ing their answer to the MCU, but no, they had to start with Bat­man v Super­man: Dawn of Jus­tice, loose­ly based on The Dark Knight Returns, which is not even in the main con­ti­nu­ity. Next up, Super­man — Action Comics Vol. 1.